I am represented in Asheville, North Carolina by American Folk Art Gallery. 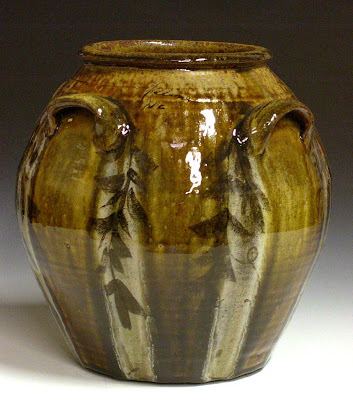 If you're in the neighborhood, stop in and talk with Betsey-Rose Weiss about seeing some of my work and all the work by NC potters. They are located at 64 Biltmore Ave.
about the prospect of a new shop. 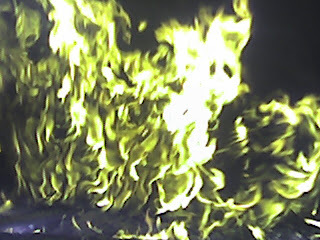 down last night and the burning embers rose into the sky. 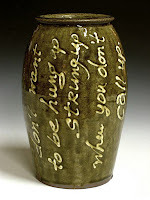 Here's another slip trailed jar with a lyric from Elvis. when you don't call up. Little sniggers on your lips. anxiety about not getting an immediate reply to his emails. of Rhodes' masterful slip trailing flourish. 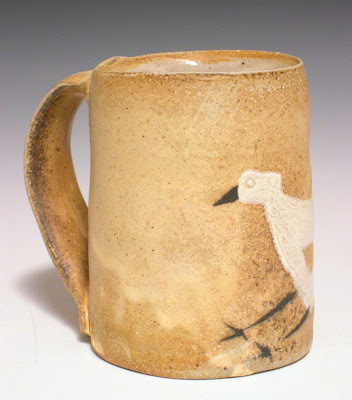 I guess a lot of potters in this state of North Carolina who work in a rather traditional mode have tried to 'channel' Daniel Seagle a time or two with varying degrees of luck. I have been after this elusive form for a little while now, and those of you who have been keeping up with this blog (thanks) have seen this form before, a couple of times. Well I finally got around to getting a shot of this version from XXV. I would hope "better luck next time". It's a little bit stiff, and if you look closely you will see gouges from "trimming" that little bit of extra clay off. 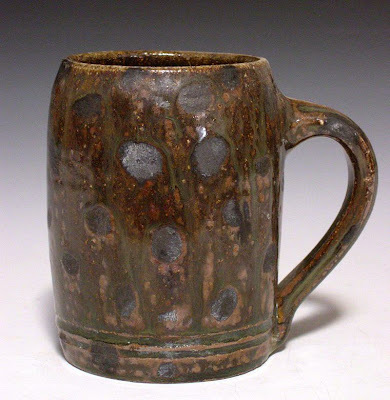 As my friend Mark would say, the alkaline glaze is especially "dendritic" because of the salt thrown into the kiln. 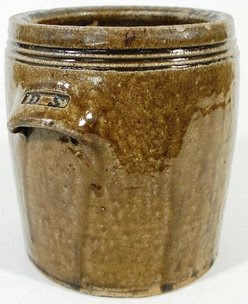 This pot measures 8.25" tall by 7.75" wide at handles. 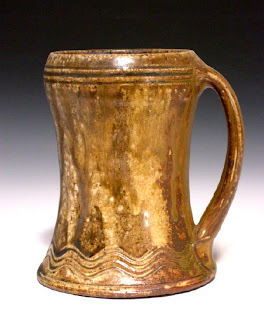 I'll make more for XXVI, which should be happening a couple of weeks before my debut at the 2008 Catawba Valley Pottery and Antiques Festival. and their rich pottery history. OK, forgive me, I haven't been working in the shop lately, I've been taking advantage of the warm weather to work at the new studio site. music and lyrics by Elvis Costello, from "You'll Never Be A Man", from the album "Trust"
Anyway, there was something that I liked about that. Maybe the mention of porcelain hooked me? Hmmm. I've been listening to Elvis since he arrived on the scene in the late 70's. 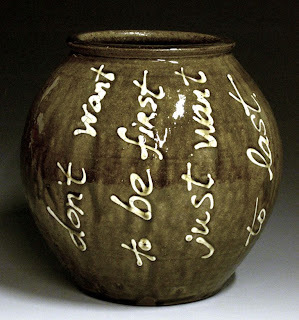 So...back to the pottery, I trailed the lyric on the next pot. I did a few others which I may share, if you like, in a future post. 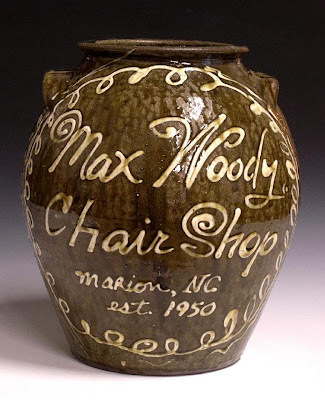 It was all a warm up, I suppose, for the "Max Woody" jar that I was to do. getting a good look around. 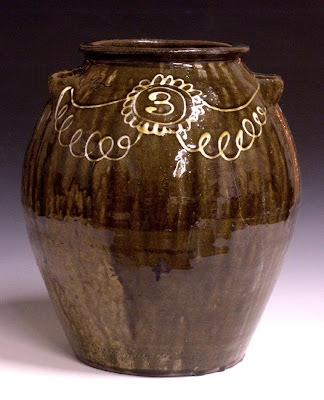 black underglaze brushwork, yellow iron oxide glaze, glass. This jar has nice glass drips around base which I am leaving for now, It sits pretty even. The pots with glass drips are fired on thrown rings, or stilts. The pots pops right off the ring after the firing. The I take the pot to a bench grinder, and finally a dremel tool to finish the grind. The glass I use comes from my glassblower friend Kenny Pieper who makes beautiful stemware in a Venetian style in Burnsville, NC. 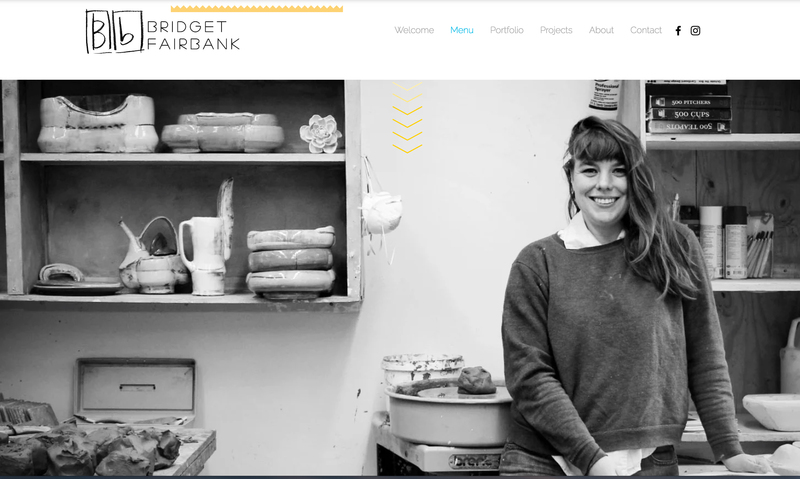 Check his work out here. 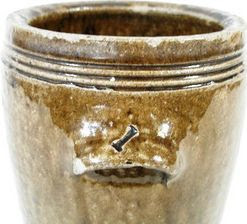 The glass is placed on the handles after the pottery is stacked in the kiln. see the post Before and After XXV. 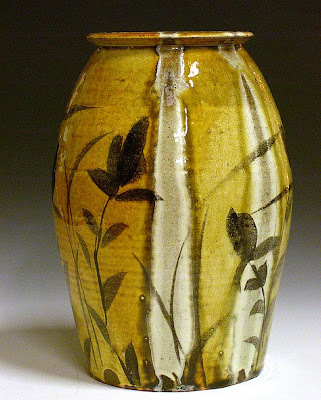 Underglaze black slip, yellow iron oxide glaze, glass. Another pot with glass melts. In this case I placed the glass rods over the top since there are no handles. Placing the right amount of glass so that the glass gets to the bottom of the pot without running past the stilt and onto the shelf is critical and I have had to learn the hard way. There's no easy road to experience. 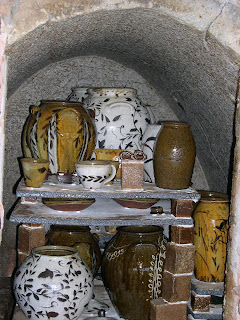 Although a reasonable potter would fire glazeware in a glaze kiln and salt ware in a salt kiln, I do both in the same kiln. I have been doing that for quite a while. In recent years I have had the notion that these two formats work against one another. The salt has to be minimized to avoid completely losing glaze color. I may try to do separate firings in the future. This pot is large and its stout. 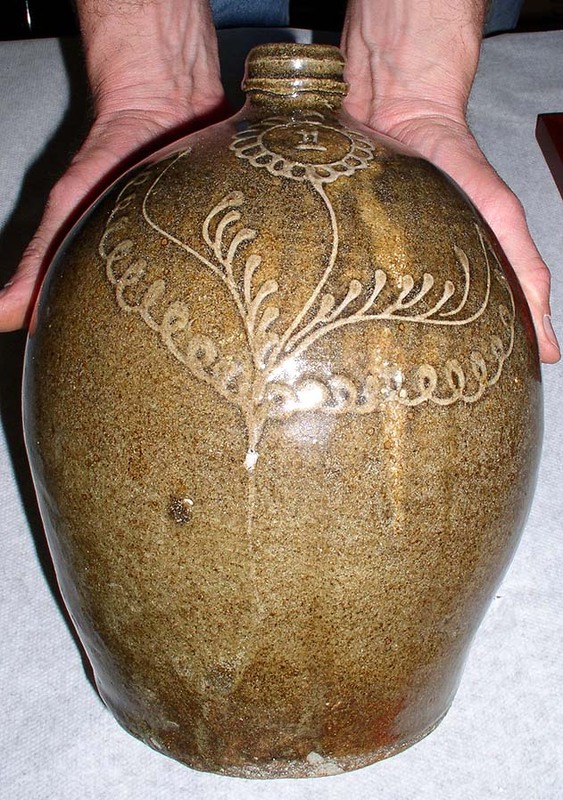 The pots I have been looking at as examples are the 19 c stoneware pots of the Southeastern US. 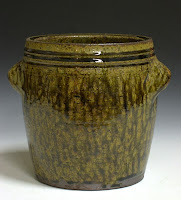 One of the characteristics of these pots is the way the line of the pot comes up from the bottom. 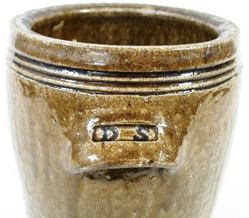 I just found this ...A Daniel Seagle very similar in all ways to the piece in the Hewitt/Sweezy masterpiece, "The Potter's Eye", except the stamped initials are a bit deeper. But in looking at the form it is very nearly the same pot. Certainly this was a size and format Seagle made many of. for 3 gallons but in the end it measured 4. I guess I got a little more out of the clay than I planned. Another favorite from XXV. David Springs commisioned me to make this jar for his friend Max Woody. 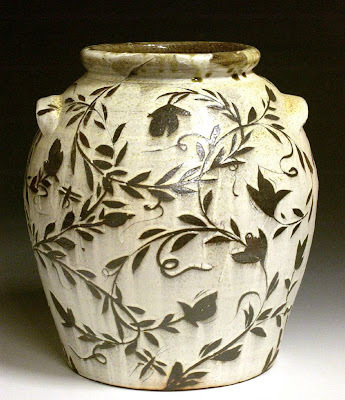 I did the slip trailing in the style of the Edgefield pottery of the mid 19c. South Carolina. 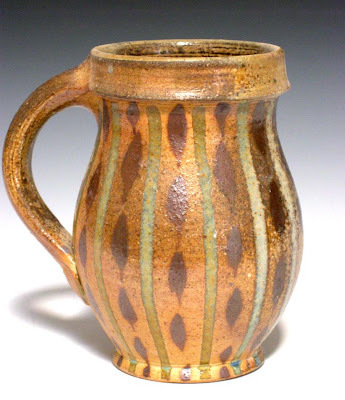 The Edgefield glaze ranged from a light green blue celadon to a darker iron brown. 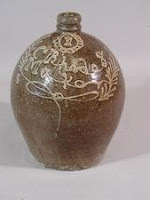 Potters like Collin Rhodes and Thomas Chandler did some beautiful slip trailing on their jars and pitchers and are considered the masters of this style. Terry and Steve Ferrell of Edgefield SC have a nice web site with some examples. 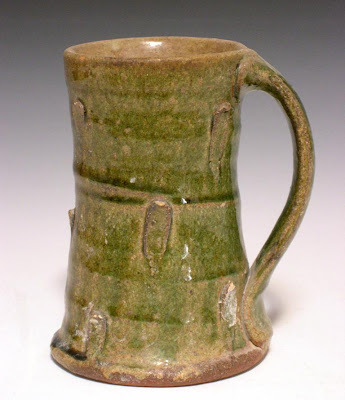 My glaze is more like the Catawba Valley tradition of western NC. 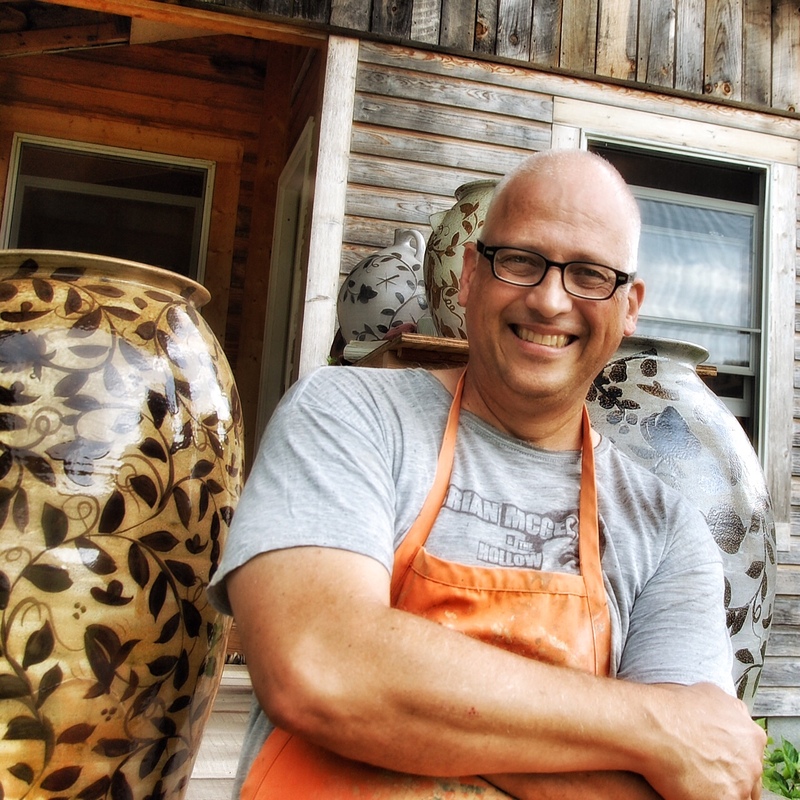 A short list of NH potters. A grandfather spinning for fun. It's not a pretty sight, not dressed up for the jury of a crafts show or magazine article, but it's the reality of tonight's dishwasher. In the true confessional mode of this format I present for anyone's perusal "the rack", including the poodle plate. The usual suspects from the days snacks, beverages, etc. For those brave enough, click on the image for a closer look. 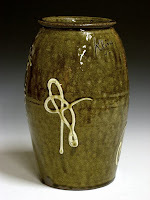 and it was great to see those pots from his collection. 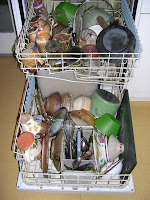 I thought I would grab a few of the mugs from the workshop dish rack. Here are of a few from the top of the pile. Some get used more than others. 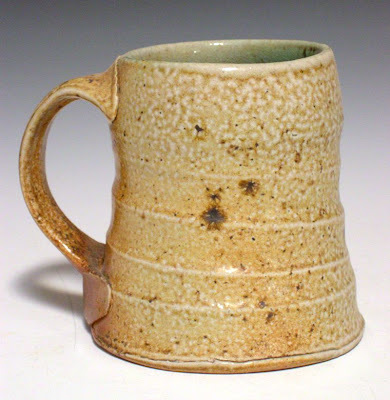 I find that with coffee, I tend to used a handled mug. Also, in the workshop, I tend to use teabags to brew my tea in these fairly large mugs. It occurs to me that they look very different shot against such a backdrop. Maybe I will post them sometime soon in action. It was time to clean up the mess left in my workshop as I fled for the kiln with decorated and glazed pots a couple of weeks ago. There was wood ash that had been washed and settled out that needed setting out to dry. There were buckets of glaze to put away. There were my brushes, my axes, put a way for a while. There were tools to get out and clay to check. There was a huge can of slaked down clay scraps that needed to be set on plaster to dry to a usable hardness. There were the books I had been pouring over during my "breaks" that needed re shelving. There were boxes, paper, packing peanuts littering the floor. There was the pile of letters that needed filing and responding to. There were other dreadfully boring details to the afternoon that I will spare ye. 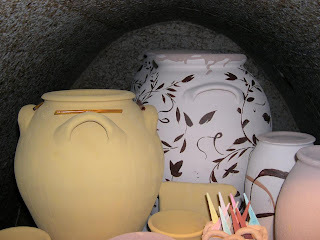 I sat and looked at some of the pots from the Christmas Eve kiln-load. Some with salt glaze, some with alkaline ash glaze with slip trailed doodles. Not bad. I wondered about all the pots I still need to make to get where they need to be. The work of all my years is only as good as the last load made. 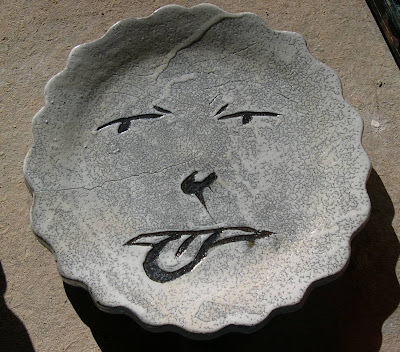 There's a ways to go with the pottery. Always, it seems, there's a ways to go. 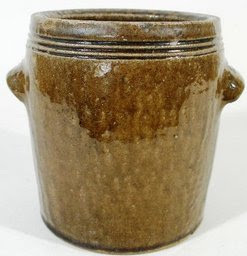 The well of pottery is deep and I will draw up another bucket full. Get a taste. Then I'll lower the bucket again. I like what I'm tasting. It's still refreshes.